Uncover the little known treasures of an uptown New Orleans neighborhood. Combine the cultural delights and delectable tastings of Freret Street on this 3-hour food & cocktail tour of Louisiana's gem accompanied by a savvy guide. Delve into the culinary scene of the city by visiting several popular bars, restaurants and gelateria's. Sample local Creole and Cajun specialties like Cajun Gumbo with lagniappe, Natchez style meat pies, homemade melt in your mouth gelato and a refreshing French 75 cocktail. Deepen your knowledge of New Orleans culinary and cultural traditions and enjoy personalized attention from your guide on this small-group tour limited to 12 people. Greet your guide at Dat Dog Restaurant at 4:15pm and embark upon your epicurean exploration of Freret Street. 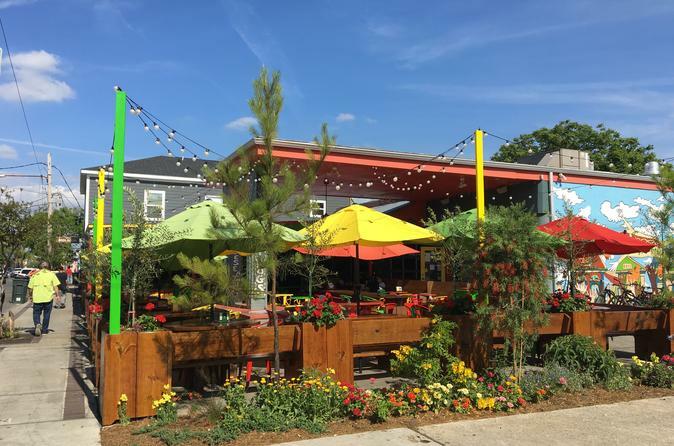 Immerse yourself in the eclectic atmosphere of Freret's atmospheric enclave replete with informal restaurants serving delectable authentic culinary & beverage treasures. Continue as your stroll down one side of the street to the next enjoying tastings along the way. Learn about each food's interesting origin as you chat with some chefs, or restaurant owners. Sample some sweets rich in Creole history from the Steens beverage to the homemade Italian Gelato. Then conclude your culinary tour at at a James Beard award winning bar favored by locals. Additional cocktails and beverages available. (own expense). Bid your guide and group farewell at approximately 7:30pm, but feel free to remain in the bar after the tour concludes.